Based on the popular artichoke version, this dip has a deeper, tangy flavor that will inspire your guests to make a recipe request. Preheat oven to 375 degrees, using convection feature if available. Cut smallest Brussels sprouts into quarters. Cut larger sprouts into more wedges to approximate the size of the small quarters. Toss sprouts with olive oil, shallots, bacon, salt and pepper. Spread thinly onto baking sheet to allow for roasting instead of steaming. Roast sprouts, stirring occasionally, for about 30 minutes or until edges are brown and crisp. Turn off oven. While sprouts are roasting, combine remaining ingredients in a large bowl. Add roasted sprouts. Place mixture in shallow, ovenproof vessel that’s suitable for serving (depending on the size, you may want to divide mixture among two smaller baking dishes). At this point, dip can be saved, covered in the refrigerator, until an hour before serving. When ready to bake, preheat oven to 350 degrees. 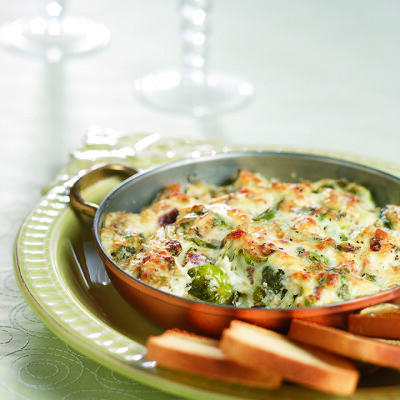 Bake dip for approximately 30 minutes or until bubbly and golden brown on top. Serve immediately with toasted baguette slices, crackers or pita chips.